Pear Bread - It's fall break around these parts, and since for the past two years I've always just picked up more hours at work since I don't have school, I decided this year I would take the week off and have a real break. 'Which of course means I went right ahead and got ye olde sinus infection. 'I guess if I was going to get sick, I already had the time off, but it seems kind of a waste. The good thing is that I have been able to do some more cooking, and even managed a trip down to South Carolina to visit some old friends. 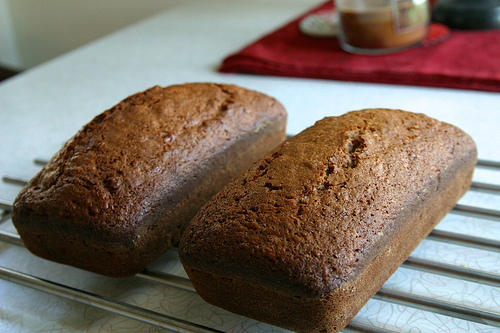 Since I was really quite under the weather the day before my trip and stayed home from work, I decided to use my spare time to make something to bring with me to give to a few of my friends, and this pear bread has intrigued me for awhile now. I knew there had to be something different then the typical banana bread or even pumpkin bread (which are great, don't get me wrong). 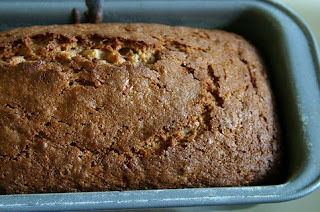 I think this is a great alternative for a nice spiced bread perfect for the cooling temperatures. 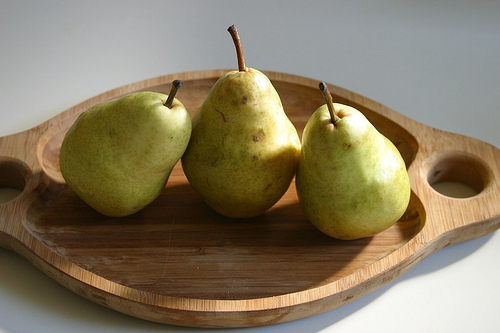 'While it isn't overtly pear-flavored, word has it that it has a growing peary-ness after a day or two. 'I had to eat some right away before wrapping the rest up to bring to my friends, and the still-warm bread with some good butter hit the spot for this girl, who even though sick, is so thankful for some time off. Adapted from Smitten Kitchen, who adapted it from Nancie McDermott's Southern Cakes , who apparently got it from someone named Cornelia Walker. Pretty much the only things I did differently was that I didn't use any nuts, which are optional anyway, but I've never liked nuts in my cakes, cookies, brownies, etc. Also, I used two loaf pans instead of a tube/bundt pan. 'Both are acceptable, but since I was going to be wrapping this up to take on the road, it seemed like loaves would be a bit more transportable. You are welcome to use a tube pan. 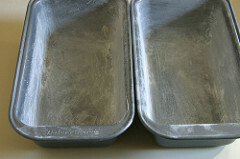 Grease and flour two 9-by-5 loaf pans or one 10-inch tube/bundt pan. (Don't know what that means? This is a good guide, but use butter instead of shortening if you can.) Preheat your oven to 350' F (175' C). 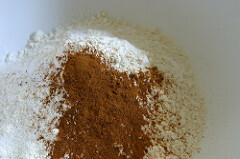 Combine the flour, baking soda, baking powder, salt, and cinnamon in a large mixing bowl, and stir with a fork or a whisk to mix everything well. Peel and core the pears. 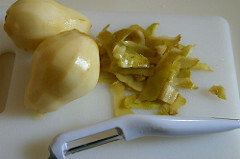 In a medium bowl, lightly beat the eggs, then add the butter or oil, the sugar and the vanilla. 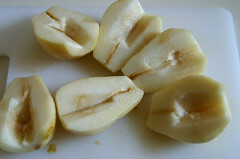 Then grate the pears until you get to 2 cups, and add them to the wet mixture, stirring to combine. 'Add the pear mixture to the flour mixture and stir until you don't see anymore flour and everything is evenly incorporated. Scrape the batter evenly into whichever pans you are using, and bake for about 60 minutes, checking after 50 or so. (Mine took about 50-55 minutes.) 'The bread is done when the top is nicely browned and a wooden skewer is poked into the middle and comes out clean.